Basically, most of times, you can achieve the custom post types functionality using regular posts and categories. However, it is much harder for a non-techie user, such our clients, to create a post, assign it to the right category and make sure it won’t screw other thinks up. While the possibilities of using custom post types are limitless, for the sake of simplicity, I will use as example a simple investment website, which will feature a title, description and a thumbnail with a property. First, I want to exemplify how the back-end of our custom post type will look like. As you can see, the interface is simplified and contains only the necessary editing areas. For more information regarding register_post_type please visit the official codex documentation: http://codex.wordpress.org/Function_Reference/register_post_type. At this point, you can go ahead in back-end and add a new investment, which will show up next in our site, after we do the following step. As you can see at the top, we specified to this page a special template name. In back-end, we have to create a page, which we can be named investments (or any other name), than assign it our newly created template. This page, will display our investments and now we can organize our general navigation easily. We specified that our custom post type should behave like a post, which means we can have single post view. We can do that by duplicating our investments.php file and name it: investments-single.php. For this file we don’t need anymore the template name anymore at the top, so make sure you remove that part, so we don’t mess up the first template. Starting with WordPress 2.9, we have the ability to easily attach to any post or page a featured image. 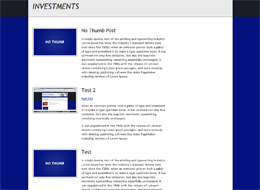 Our purpose is to show up a preview of this thumbnails in our investments back-end overview. elseif ("thumbnail" == $column) echo $post-&gt;post_thumbnail; //shows up our post thumbnail that we previously created. Using custom post types we can provide easy to use content management systems, yet powerful and flexible. Going the extra mile and customize the WordPress back-end, it makes a difference between good developers and great developers, while our clients can enjoy their polished and simple to use websites. Then, you don’t need the two functions to enable thumbnail support – it will automatically be supported. elseif (“thumbnail” == $column) the_post_thumbnail(); //shows up our post thumbnail that we previously created. Is there a way to specify the width of the custom columns in the Edit backend? Other than through the CSS, I mean? CSS is a good solution for that and it should work well. I have a strange issue. The column pulls the thumbnail, but it pulls the same exact photo for every post… I haven’t modified your code in any way, and even in your example its the same thumbnail for both posts. Why is that? Freddie, you need to assign the featured image for each post, if not, a default one will be loaded. In my demo I uploaded the same for each post. When you edit a post, you have under publish section, on the right, “Set Featured Image”. How would you display data from a custom meta box? Thanks for the post. This has been a great help in devoping a CMS for my church using wordpress. I am having a issue with my permalinks. My blog url shows up twice in the permalink. I will Tweet you blog as a thankyou! or %category%/%postname%/ without the link in the front. I had %category%/%postname%/ on my blogs until i read an article on yoast or a similar site that showed that the %category%/%postname%/ permalink structure is not favorable. Anyway i second Lucian’s recommendation and if you implement it your problem will be gone! It’s good to note that you can’t change the columns of a post type that’s set to “Page” or has “hierarchical => true”. Thanks for this post, it was almost everything I was looking for. Can anyone help me with creating a custom post type that allows the uploading of two images (before pic, after pic) and then displays these images side by side on a page? The part I am having trouble with is adding the two image upload areas and how that is designated in the custom post type. I am relatively new to WP and any help would be appreciated. WordPress 3.1 (I’m currently using the beta) brings with it sortable columns. The following post shows you how to make your custom columns sortable.